If you have experience with two large neodymium magnet, you must be known that it is very dangerous to combine them. 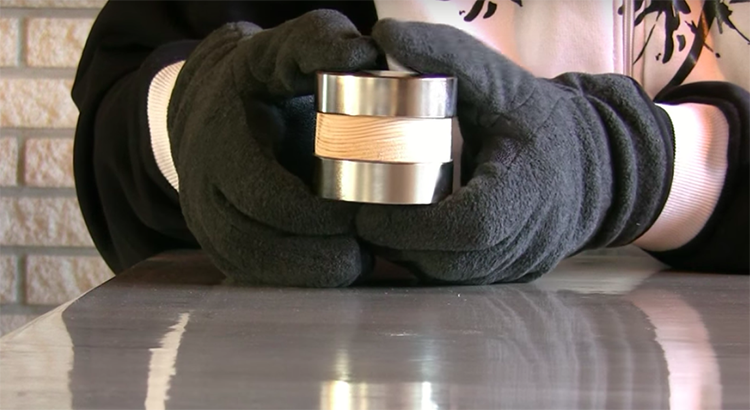 So we would like to show you how to safely put two large neodymium magnets together. And with a spacer in between the magnets. And the most important point, without any magnets splitting and shrapnel flying around. 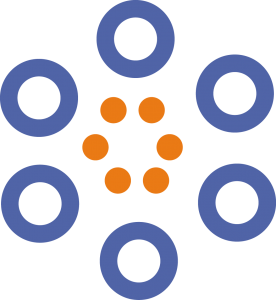 So – what do you think we should need? Well, we think we should use thick gloves. And The thicker well be better. Wearing gloves will not prevent you fingers from being crushed if they are caught between the magnets in an accident. But they might make it easier to get your fingers unstuck again. Next, we need a security board. This is just a wooden plate with some metal plates glued to the bottom half. 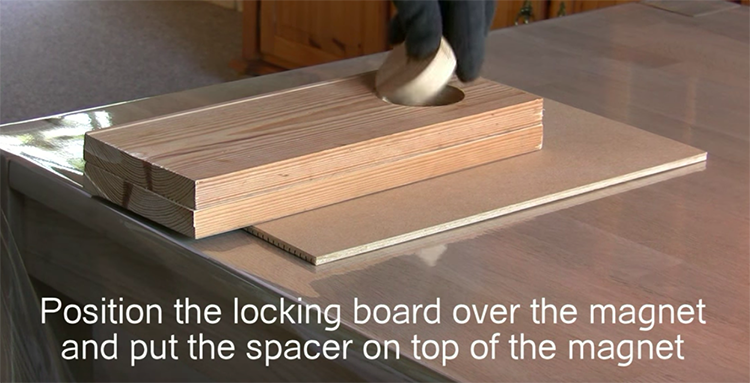 You will also need what I call a locking board. It’s just a wooden board with a hole in it. The diameter of the hole should be the same as that of the magnets. And the height of the board should be the same as the magnet plus the spacer. Next, in line, we have a large wedge. The width of the wedge should be the same as the diameter of the magnet or larger. 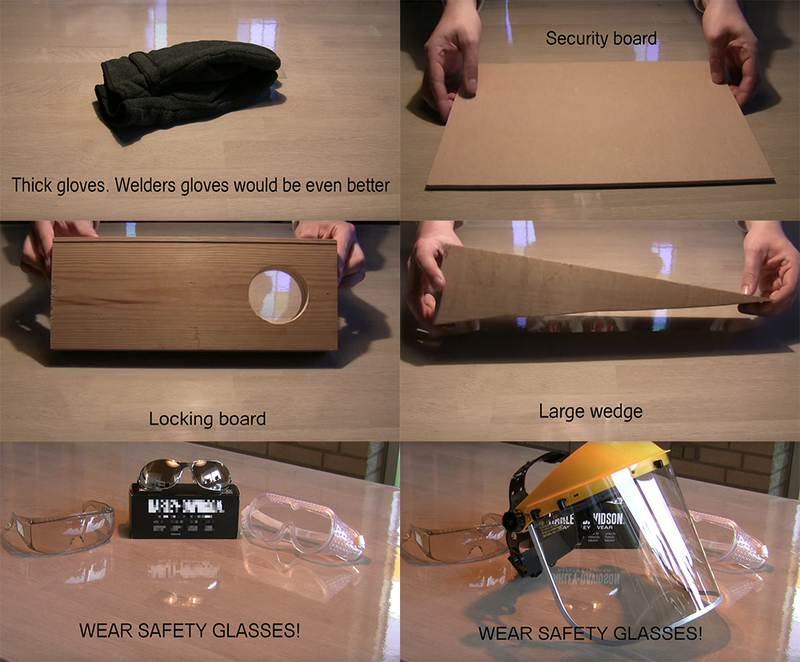 At last, we need wear safety glasses. If the magnets accidentally smash together. They could shatter or chip sending very sharp fragments all around. Personally, we suggest using a complete face shield with these larger magnets. Okay – after we have collected all of the necessary equipment we need to clear our work area. Remove all metals. Ya, all metal, so it means that it includes the keys in our pocket, our wristwatch, and our mobile phone. Also be aware of lamps, radiators, and metal in the table that could interfere with our work. And now for the part that we have been waiting for. Let’s combine the magnets and see if we can do it without hurting ourselves or chipping the magnets. it in an upcoming post. 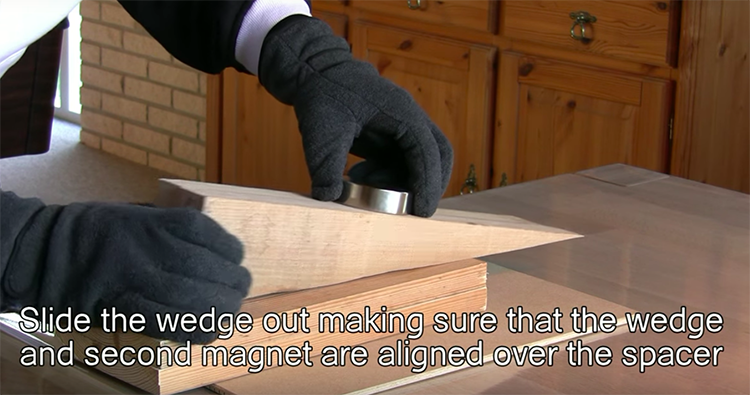 Now place the locking board over the magnet and put our spacer on top of the magnet. 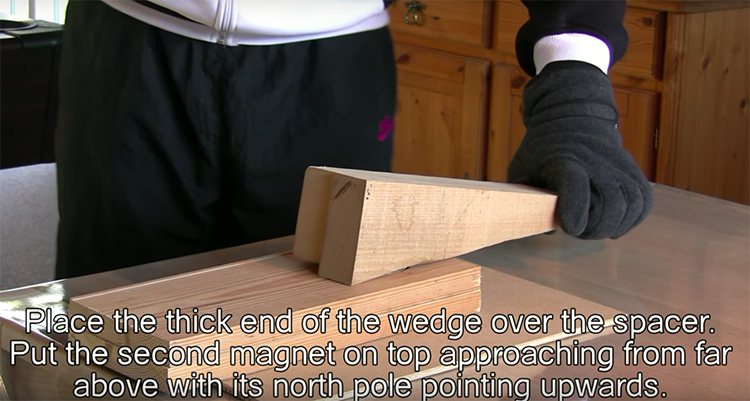 If anyone thinks the next step is to put the other magnet with the north pole facing upwards and sliding it over the spacer they would be completely wrong. If we thought that we are not ready to handle large neodymium magnets yet. Here we have – somewhat simplified – drawn in green color two of the magnetic field lines from the first large neodymium magnet. Notice the direction of the magnetic field indicated with arrows. If we put the second magnet in this magnetic field with its north pole pointing upwards it would act like a compass and try to turn around with a large force. This is an uncontrollable position to combine the magnets from. Instead, we need to put the wedge over the spacer and guide the second magnet in from far above, Again with its north pole facing upwards. Hold the magnet and wedge firmly and make sure our fingers are not between the two magnets. If anyone feels resistance in the second magnet your polarity is wrong. Abort immediately by lifting the second magnet straight up and turn it 180 degrees around before trying again. And then slide the wedge slowly away making sure that the wedge and the second magnet are aligned directly over the spacer. The force needed will be higher and higher with the magnets coming closer and closer. Adjust the second large neodymium magnet so it’s centered over the hole in the locking board. 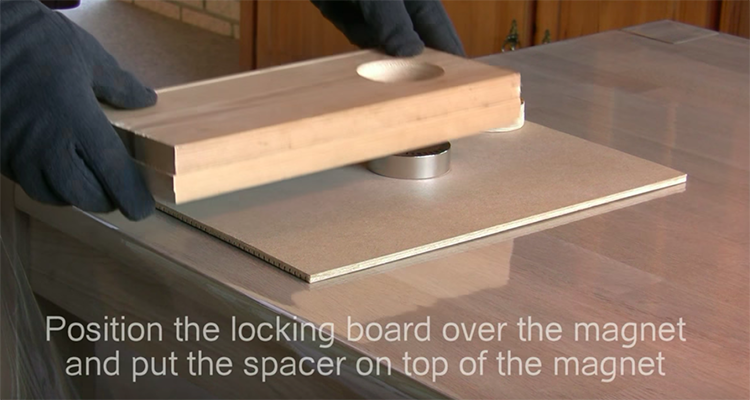 Lift off the locking board and slide the magnets from the security board by pushing on the lower magnet. Do not push on the spacer or the upper magnet. Finally, we did it done. In an upcoming post, we going to show you how to take them apart again.